(March 27, 2008)--Bess Hieronymus, professor emeritus in the UTSA Department of Music, died peacefully at her home on Saturday, March 22. 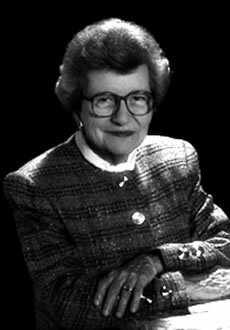 Born June 22, 1922, in Temple, Texas, Hieronymus was the first woman appointed to full professor at UTSA, where she developed and spearheaded the organ studies program. Hieronymus began playing at age three and took her first job as a church organist at age 12. She earned a bachelor of music degree from the University of Mary Hardin-Baylor in Belton and a master of arts in music degree from Smith College. Hieronymus was the first person to receive a doctor of musical arts degree in organ performance and musicology from the University of Texas at Austin. Through her tireless efforts, Hieronymus helped UTSA's organ program achieve national recognition and mentored many students who went on to distinguished careers. She supervised the installation of the 1982 Casavant organ in the UTSA recital hall on the 1604 Campus. For 17 years, she organized the William C. Hall Organ Competition for undergraduate and graduate organ students in Texas universities. Friends and colleagues honored Hieronymus through gifts to UTSA establishing in 1989 the Bess Hieronymus Endowed Scholarship, and in 2007 the Bess Hieronymus Endowed Faculty Fellowship in Music. In 2004, UTSA honored Hieronymus once more by naming in her honor the Casavant pipe organ. Hieronymus' many awards and accomplishments include the J.C. Penney Award, The Headliner Award, Texas Teachers Award, Outstanding Alumna Award for Professional Achievements, two Hall of Fame Awards for exceptional talent and the Yellow Rose of Texas Education Award. She was the first American and first woman awarded membership in the prestigious National Russian Musical Society. Additionally, the Texas House of Representatives passed a resolution thanking her for her musical contributions to Texas. A music offering for Hieronymus will be at 2:30 p.m., Sunday, March 30 at First Presbyterian Church, 404 N. Alamo St., San Antonio, Texas, 78205; a memorial service will follow at 3 p.m.
To donate to the Bess Hieronymus Endowed Faculty Fellowship in Music, visit the UTSA Giving to the University Web site. On the online donation form in the space labeled "Designation," please reference the Bess Hieronymus Endowed Faculty Fellowship in Music.